Storyshowing is an instruction manual for making connections. Storytelling has been shown to be one of the most effective methods of persuasion, motivation and inspiration, yet the disconnect remains — you're still only telling. To truly influence people, you need to go deeper than that — you need to show them your story. By inviting your audience in, you connect on a much deeper, more emotional level; you bypass the brain and connect at the root of what it means to be human, leaving a profound impact on their entire outlook. 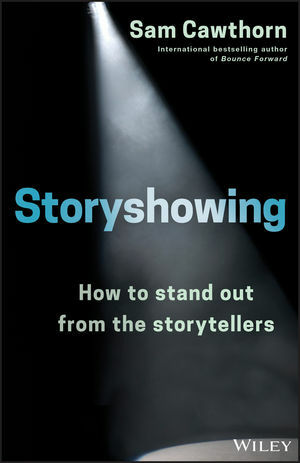 This book shows you how to transcend telling and start showing your story, using an easy-to-follow framework you can start applying today. Unearth your own experiences, and bring your vulnerabilities out into the light; share your emotions and forge a path to true communication. Use images, body language and gestures as tools to build that indelible connection; then and only then will people truly engage and transform their thinking. The difference between telling and showing is like the difference between a lecture and a play. It's the difference between giving information and taking the audience on a journey. The difference between a brochure and a test drive. Storyshowing helps you level up your communication to leave a lasting, more profound impact. SAM CAWTHORN is a bestselling author, a speaker and an award-winning educator who reaches over 100 million people every year. He is the CEO of Speakers Institute and a Young Australian of the Year. Sam resides in Sydney with his wife Kate and their three children.